Todays theme is trees and ornaments. 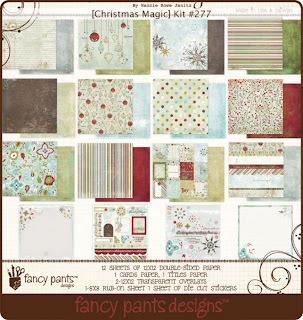 Last year I bought some of the beautiful PP "Christmas Magic" from Fansy Pants Designs. It is fantastic for christmas cards and tags. I have these 3 cards to share with you all today. All stamps are from Hero Arts "Swirl Christmas", "Merry Christmas" and "Tree-Mendous". Nej, Sanne - jeg taber helt pusten. Hvor er du flittig. Det er nogle søde kort og mp er i nogle dejlige farver og ikke alt for julede. Hi Sanne! Love the new look of your blog! So fun! And these cards are wonderful! Such pretty paper! Beautiful set of cards. Loved the soft papers and the designs. these are soooooo pretty, Sanne! beautiful use of those pps! love them!